Charging System Amps : 130A max. Isolation technology has shown tremendous potential due to various technological developments such as transfer, filtration, granulation, ventilation systems etc. Isolator means a physical barrier between a process and its operator. An isolator is closed system whose size and features vary according to the type of application. 1.The breaker cannot be moved from test to service unless the breaker compartment door in closed. GMP compliant construction with all product contact parts made of SS316L Chamber construction free of cracks and with radius & rounded corners FDA approved silicon gasketing material and hypalon gloves is used. PLC is used to communicate with the VHP generators and control uni-directional airflow speed & control isolator pressure. 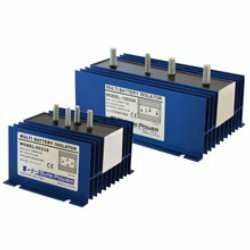 Our clients can avail from us a wide array of Battery Isolation. It is designed for the purpose of isolating power from battery to vehicle so as to stop battery drain during long storage period. Furthermore, the complete product range is marketed at industry leading prices for the benefit of our esteemed customers. Minimum Order Quantity : 50 Pcs. Possible contamination due to exposure of clean-room environment or personnel to process media can be unacceptable in high toxic applications. A decontaminated Isolator unit under slight vacuum that provides uncompromised, continuous isolation of its interior from the external environment is necessary in this case. Our range of isolators is used for isolating the electrical power supply of electrical installations maintenance, cleaning or repair work. These protective systems are made using innovative engineering concepts that guarantees reliable performance. Designed to isolate power from battery to vehicle. To avoid battery drain during long storage period. - Negative Pressure with respect to atmosphere. - Digital pressure controller to maintain a constant pressure.